Plan a vacation at this home in the Lakes Region of New Hampshire. 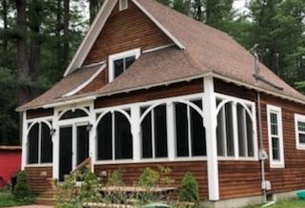 Central to Meadowbrook Arts Center, Gunstock Ski and Recreation Center, Ellacoya State Park and Beach in Gilford, this home has three bedrooms, livingroom, kitchen and one bath. Spend your family vacation at this lovely condo located at the beautifully maintained Samoset Community. Featuring 850' of prime shorefront overlooking the Winnipesaukee Broads and the Ossipee Mountain Range. Lovely Vintage Lakehouse located on Lake Winnipesaukee in Meredith. Come enjoy yesteryear with modern updates! Large deck with plenty of seating and views of Bear Island. Or get cozy in the screened porch morning and night. Enjoy your lake vacation in this beautiful newly appointed 6 bedroom Custom Cape! Short walk to your private shared Winnipesaukee beach with day dock, raft, boat ramp in calm cove. Interior features all new hardwoods, paint, granite kitchen. This Lakes Region rental home bestows stunning views of Lake Winnipesaukee and beyond. On clear days you can even see Mount Washington! Comfortably sleeping 8! Beautiful waterfront vacation home on Hermit Lake with 200ft of private sandy water frontage. The Southern exposure will give you sun all day long and the setting is just off to the west. From the beach, the large deck or the private master bedroom deck the lake and mountain views will forever keep you smiling! Charming and bright 3 bedroom 2 bath waterfront home on Silver Lake. This home has it all - 60' of owned waterfront, beach, mooring, lake and mountain views, large 4 season sunporch and gorgeous sunsets! 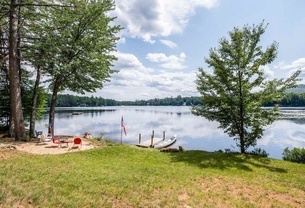 Enjoy the best of both worlds by having an incredible home on lovely Wakonda Pond located only minutes from the town beach and public boat launches on both Winnipesaukee and Squam Lakes! Blueberries for breakfast can be yours at this beautiful waterfront vacation home on Lake Winnipesaukee with awesome views of Stonedam Island. Come stay at this wonderful home in Meredith and kayak to Stonedam Island. This prime location on Pleasant Street is within walking distance to the shops and restaurants of Meredith and offers front row seating for watching the July 4th fireworks, pond hockey tournament and ice fishing derby. Located in Alton Bay, this home is situated on the end of a peninsula bestowing panoramic views overlooking the lake and mountains. 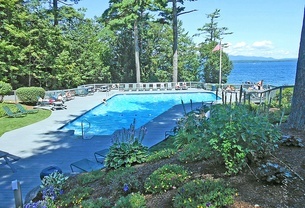 This tranquil piece of heaven on Lake Winnipesaukee is the ideal spot for your family vacation. Sit on the back deck and listen to the loons while the sun sets over the lake. This four bedroom, two bath home sleeps fourteen. You will find it easy to relax and enjoy everything the Lakes region has to offer in this two-story Colonial. This waterfront home features beautiful scenic views of the Broads on Lake Winnipesaukee from two decks. Conveniently located close to Weirs Beach and Lake Winnipesaukee this home is the perfect spot for your year-round family vacation! 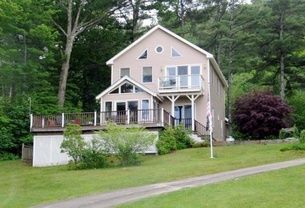 Come stay among the pines in this relaxing, lovely waterfront Lake Winnipesaukee lake house located in Meredith. Sleeping 8 with 3 bedrooms and 2 baths.There is a private sandy beach and a dock for a 30 foot boat.